Southeast Colorado Springs is one of the best places in the region to find spectacular foreclosure deals. With many of these homes listed under 100K, this area is popular among those seeking a first home, military families and those looking to invest in a fixer-upper. There are many different neighborhoods in Southeast Colorado Springs, which means there are plenty of opportunities to find that perfect deal on the perfect house. Park Hill, Eastborough, Pikes Peak Park and Southborough feature many single-family homes built in the 60's through the 80's and is a great place to find foreclosures. Spring Creek is a great place to find a newer model foreclosed condo or townhome, and Soaring Eagles is a newer home community where foreclosures can be found in the upper 100's and lower 200's. Valley Hi features golf course living in comfortable Ranchers built in the 60's and 70's. One of the great things about living in Southeast Colorado Springs is that you don't have to go very far to find anything you might need. S. Academy Blvd runs right through the heart of the area and is filled with numerous shopping centers and other amenities. To the north is the Citadel Mall and Citadel Crossing, which features countless shops, restaurants, a couple of movie theaters, fitness centers and home improvement centers, banks and more. To the south is the Valley Hi Golf Course, a Home Depot, several car dealerships, restaurants, Sam's Club and the Carmike 10 movie theater. Also, the Powers corridor shopping, entertainment and dining is just a few minutes away to the east via Platte Ave, Airport Rd or Fountain Rd, and Downtown Colorado Springs is just a few minutes to the west. Southeast Colorado Springs also has the highest percentage of military families in the region. Fort Carson is just a few minutes south on Academy, while Peterson AFB and Schriever AFB are just a few minutes to the east via Airport Rd or Platte Ave.
Harrison District 2 is the primary school district in this area. Since its inception in 1874, the Harrison school district has been committed to its enduring partnership with the community to educate its growing student population. Most of the high school students here attend Harrison and Sierra High Schools. 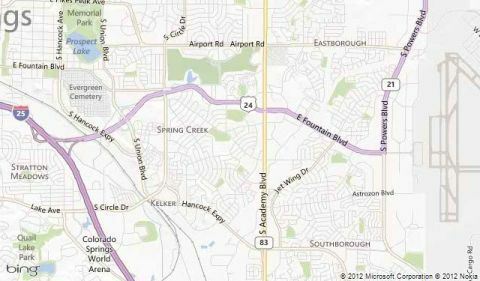 Colorado Springs School District 11 also serves some of the area. Southeast Colorado Springs is one of the first areas that should be considered when looking for the best foreclosure deals. With its affordable homes, access to military bases, plenty of shopping and entertainment areas as well as great schools, buying a foreclosed home or condo here is a wise decision. Click here to search all Southeast Colorado Springs homes for sale.